Our range of products include poly house structure. Keeping in mind the diverse requirements of the clients, we offer Poly House Structure that can provide higher temperature and/or humidity that are available in the environment. 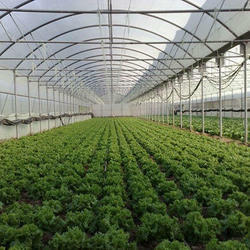 The polytunnels/poly houses can also protect crops from intense heat, bright sunlight and strong winds. This helps the crops to grow on all seasons. Every factor influencing a crop can be controlled in a poly house. This poly house gives protection from excess rainfall, wind current, scorching sunlight and extreme cold conditions.